Which journals are listed on my syllabus? Does your syllabus list required or recommended readings? These are journals that your faculty member has found relevant readings from for your course and are likely important journals in the field. When you do a literature search in @LL Search or Google Scholar, you’ll probably notice that certain journal titles come up repeatedly in your results. These are likely important ones in your field. To see how these titles rank against other journal titles, see the next section. In every discipline there are journals that scholars consider highly influential. Journals are judged by various metrics, including some that assess the "impact" of published articles. These metrics usually look at the number of cited references made to papers published in a given journal. Lesley Library does not subscribe to Journal Citation Reports. You may find a journal's impact factor listed on its website. If you do a Google search for the journal, it may appear on the landing page, or it may be included a link to About, Journal Home, Overview or similar areas of the journal. 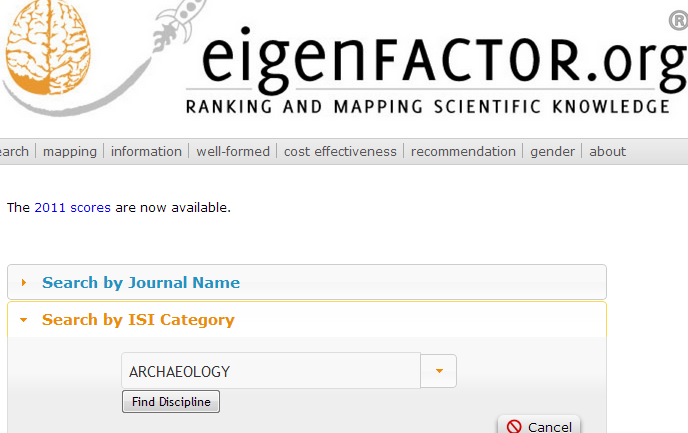 Eigenfactor measures the impact and importance of science journals in the scientific community. On their website, you can search for a specific journal, search by discipline (choose an ISI Category), or search by year. Where do the well-known authors publish? Do you know the names of any of the important authors in your field? If you're not sure, check your syllabus to see which authors your faculty has asked you to read. Try an author search in in @LL Search ﻿ to see which journals they choose to publish in.